Geico's campaign to identify the best of its many memorable commercials is a no-brainer -- it's the Cavemen. End of debate. This series of commercials, created by the Martin Agency, had modern-day cavemen encountering insulting messages about their community in Geico ads within the ads. They were so impactful that ABC adapted the concept for an entire sitcom. Not that this sitcom, titled simply “Cavemen,” went anywhere (it was cancelled after seven episodes in fall 2007). But still -- no series of TV commercials had ever spawned their own sitcom before (to my knowledge, anyway). In case you somehow missed this, Geico has mounted a campaign to showcase its own commercials, and in the process, enlist consumers to vote online for their favorite. Of the dozens of whimsical commercials Geico has produced over the years, the company has selected only 10 for its “Best Of” campaign. 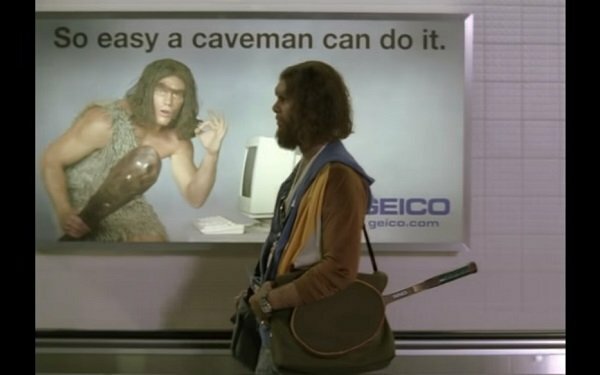 Only one of them is a Caveman commercial -- the “airport” spot in which one of the cavemen is seen on a moving sidewalk in an airport when he passes a Geico billboard with the headline “So easy a caveman could do it” (seen in the screen grab above). According to Wikipedia, Geico made at least 21 separate Caveman spots. “Airport” was the fourth in the series, preceded by No. 3, which happens to be the TV Blog’s own personal favorite of the Caveman spots. In this one titled “The Apology,” a Geico spokesman is seen in a commercial within the commercial reciting the offensive tagline. He is then seen taking two cavemen to lunch in a modern restaurant in an effort to apologize for the commercial’s insensitivity. “Seriously, we apologize,” he tells them. “We had no idea you guys were still around!” the Geico rep says, by way of explanation. While I am partial to almost any of the Caveman Geico spots, I was surprised to learn, as of yesterday (Tuesday), that the Caveman “Airport” spot was running a relatively distant third with 10% of the vote. No. 1 on Tuesday, with 34% of the vote, was “Hump Day,” the spot with a camel wandering through an office on a Wednesday. No. 2 was “Maxwell the Pig,” in which a piglet is being carpooled and going “wee wee wee” all the way home. This spot had 17% of the vote on Tuesday. Ranked last, with 2% of the vote was the spot called “Soap Opera,” a spoof of daytime dramas. While the Caveman series of commercials was long-running, the concept was lost in translation somewhere during the long development process that precedes the production of a sitcom. When the “Cavemen” sitcom premiered, one critic declared it to be “extinct on arrival,” even though he had praised the show's pilot just weeks earlier. The problem was that the network decided not to premiere with the pilot, but with another episode that was not as good. In fact, the show was almost universally panned, with some critics complaining that this show based on a series of commercials amounted then to a half-hour commercial for Geico in sitcom form. Personally, this aspect of the show was not a problem for me. If memory serves, the problem with the show was that after it was run through the sausage factory of network development, it came out a lot less clever than the commercials that preceded it. Among other things, the Caveman “Airport” spot was distinguished by the great piece of music chosen for it -- a song called “Remind Me” by an innovative Norwegian music duo called Röyksopp. The version of the song used in the commercial is a softer version of one that accompanies the group's video for the song. The video version has a more prominent bass line and possibly a faster tempo as well. I discovered the video some years ago while researching another column about this Geico spot. In its depiction of our modern world, this entirely animated video -- produced in 2002 -- is still relevant today. Simply put, it is one of the finest music videos ever made. You can watch it here on Vimeo.